Because I am a literary writer, writing about climate justice, people often ask me, What is the importance of the arts in the climate struggle? I turn to Friedrich Nietzsche, the nineteenth century German philosopher. “We have art in order not to die of the truth,” he wrote. So then. What are these lethal truths, the truths that break our hearts, sap our spirits, and turn us to stone? How can art save us in the face of those truths? Those are my two questions. What are the paralyzing truths that the world faces? Imagine our good fortune, to live in the time of thrush-song and thirty thousand species of orchids, the time of small laughing children and whales that teach each other to sing. The fate of these lives is not a matter of indifference or economic expedience. These lives, human or otherwise, are the irreplaceable consequence of planetary creativity over four billion years. And they are the progenitors of everything that will grow on the face of the Earth. Truth number two. That the greed and duplicity built into the extractive growth economy threaten to make the planet uninhabitable for the creatures that evolved in the mild Eocene era. That would be, among others, us. The economic machine is killing the planet — in an unspeakable cruelty, starting first with those who have no voices to defend themselves, the plants and animals, people on the economic and geographical margins of society, future generations, and children of all species. Over the last fifty years, poisoning and plundering have reduced the number of plants and animals on earth by forty percent. This is the wonder-filled world that we are destroying, the lyric voices that we are silencing, the sanctity that we are defiling, at a rate and with a violence that cannot be measured because we have only the sorriest understanding of the world’s multitude of lives. Truth number three, the most important of them all: It doesn’t have to be this way. We are creatures of desperate love who are born with the ability to imagine a different way. We can change this destructive course. It’s true that we will live to see the end of a way of life on Earth. But whether we witness the emergence of new ways of life based on sharing and intelligence and justice, or whether it is the emergence of a degraded, dangerous, brutal new slide toward who knows what? — that is a human choice. These are hard, hard truths, we may agree. It is difficult – maybe impossible — to face them. So we jeer at our truth-tellers and cheer the liars and deniers, in fear that facing the truth would destroy us. How can art save us? 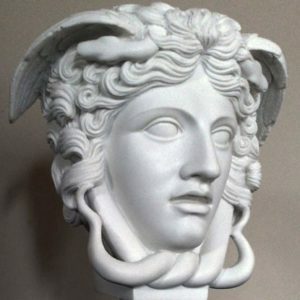 Do you remember Medusa, the monstrous woman in Greek mythology? Medusa was a Gorgon, with such a terrifying face that no mortal could gaze upon it without dying – the reptilian face, the poisonous hair dripping snakes. A person who looked straight at her would turn to stone. And isn’t this the danger, that when people look straight into the face of the desperate truths of our time, they are turned to stone? Their hearts are hardened. They are unable to act. Joyless, inhumane, immobilized, they freeze into business-as-usual, as if they had no choice. Enter the hero Perseus, who carried (along with his winged shoes and his magic scythe), a beautiful reflective shield. When he held the shield up and caught Medusa’s ugly image, here was Medusa — transformed, but not transformed. Revealed, but not represented. Revealed. Revealed! And Perseus, seeing her in an entirely new way, faced her reflection boldly, and cut off her head. What is this reflective shield that can show us the danger without turning us to stone? What can open our hearts, without breaking them? What can replace paralyzing fear with a new vision of what is beautiful and possible? What can break the bonds of lies and denial? What can allow us “to see, to sing, to welcome with courage and grace and imagination, whatever asks entrance into our lives”? The words are from the poet, Jane Hirschfield. The answer, of course, is art, this magic reflective shield. In a time of climate change, ecological collapse, and social transformation, art allows us to see hard truths without being destroyed by them, but rather lifted and heartened. Let us celebrate the artists who have set aside their ordinary work and stepped up to do the work of the moment. Let us be those artists. Our work may be inside or outside the gallery and concert hall, in the streets, in the halls of politics and power, in the new street theaters of creative disruption. These are the voices of writers, the genius of dancers, the vision of artists — all the power of words and story and image that can help us escape finally from the narrow self-interest of our economy, the catastrophic vision of our future, and the paralysis of our age — and imagine a way forward. Kathleen Dean Moore, Ph.D., is the award-winning author or co-editor of a dozen books. Her newest book is a novel, Piano Tide, winner of the WILLA Award for Contemporary Fiction. For many years, Kathleen explored wet, wild places with creative nonfiction books such asRiverwalking, Holdfast, Pine Island Paradox, and Wild Comfort. But global warming and ecosystem collapse have deeply unsettled her, calling her to a new life of public speaking and advocacy, and her writing has become a passionate defense of the world that she has celebrated for so many years. Her 2016 book of essays, Great Tide Rising: Toward Clarity and Moral Courage in a Time of Planetary Change, follows her pivotal anthology, Moral Ground: Ethical Action for a Planet in Peril, testimony from the world’s moral leaders about our obligations to the future. She lives in Corvallis, Oregon and in a small cabin where two creeks and a bear trail meet a tidal cove in Alaska.